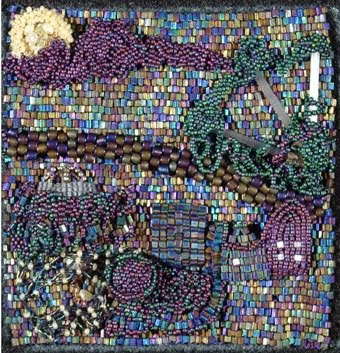 Nearly thirteen years ago my beading journey started when Bethany Barry's book, Bead Crochet, caught my eye at our local library. Searching eBay for supplies led to the discovery of The Glass Seed Beaders Group, a very supportive online beading community. 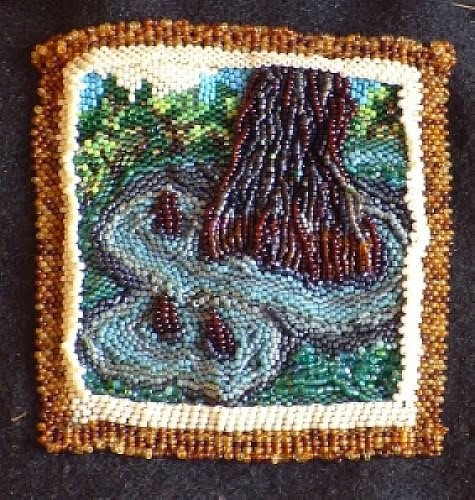 Through the GSBG's Gulf Coast Tapestry Project I learned the joy of free form beading. I am experimenting with Diane Fitzgerald's butterflies. Also I am attempting to create my first cabochon necklace for my future daughter-in-law. How does beading touch our reallity? I have been working on the page for June over a month now. It has been a very contemplative process. It originally started as a reference to the cities off the coast of India and the Indian road crossing the sea to Sri Lanka which have been regarded as legend. A favorite lunchtime chat subject with one of my friends. Now, of course, underwater archeology and satellite pictures are revealing some of these legends are based on fact. The world over a great deal of humanity's past was covered by sea water as the Ice Age came to an end. My dear friend has been very generous in sharing her childhood memories of growing up in India including some of the stories about India's distant past. We even spent one lunch break online looking at Sanskrit. That is what prompted me to include an aum on my June journal page. Sunday, July 15, I made a point to take some donations to ARC, a local charity shop. As usual I did a quick check for antique linens and china, but then felt drawn to the pots and pans section. This is an area I never check. Almost hidden under the pans I spotted an oddly lumpy rectangle. Once freed from the heap it was revealed to be an extremely heavy copper plaque with a very dark patinia having an odd script scratched into it and many ornate figures and creatures which seem to have been sculpted. The plaque seemed very old and definitely had an "Asian feel" to it so I decided to bring it into the office to show my friend, Puspa. She is very well educated and widely traveled and could at least figure out what culture it came from. Puspa was nearly speechless when she saw it. Apparently I had found a very old religious piece which belonged in a Hindu shrine! The script is in an old form of Sanskrit and the figures are Hindu gods. The very day I gave the plaque to her was apparently the most auspicious time in the year to give such an item! She has reverently placed the plaque in her devotional space at home. Now as I continue to work on my Aum page I can not help but wonder do we draw items into our lives with our art work? Will echoes of ancient Africa or America surface as I bead along? what might be evoked if I include images inspired from the drawings of the Australian Dream Time or from the cave painters of Europe? This just was not working. It felt "backwards" and awkward. Now this works for me. Who would have thought merely changing the direction would make such a differ ence? I out lined the body with 20/0 beads couched down with black nymo. He has fresh water pearls for toe nails and the rest of the beads, so far, are 15/0 irridescent with dark gray for the legs on the back side put on with back stitch. Well, I have great ideas, but they just aren't coming out right on my page. Everything has been ripped out (three times now) and I am starting over once again. Rajasthan of Katah did a beautiful painting of an elephant charging a rhinoceros way back in 1690. I love the strength and forward motion he achieved with very little detail. 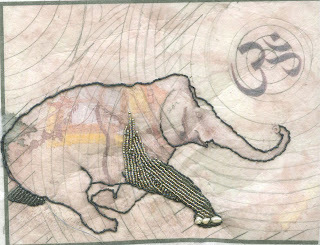 I have used part of his elephant as the main focal of my first journal page. Tried using 11/0 beads for outlining my major element, but they just looked to stiff so switched to 15/0. These smaller beads are more fluid, but have decided to couch matte raku iris purple 21/0 beads instead. Getting the teeny tiny beads onto a couching thread has been a real challenge (even with a size 15 beading needle it was tough) , but the final effect is just what I hoped for. These dark thin matte lines will contrast nicely again the larger opal gray and silvery beads that will be used for the main body of my charging elephant. I am hoping they will suggest inked lines. My mind excitedly jumps from one idea to another. Actually committing to a plan of action, however, is a struggle. Guess the best thing to do is publicly state what I will attempt to convey with my work and then get started. A few years ago I watched a fascinating program about humanity's journey out of Africa and across the world. It was mentioned that during the Ice Age our seas and oceans were much lower and basically once the ice melted a whole world of humanity's prehistory became submerged. I was captivated! "Journey", my first free beading project, grew from this. Humanity is carried on the shoulders of our ancients. That keeps coming into my mind. An Indian friend has offered to translate this in to Sanskrit, that most ancient of languages, for me. 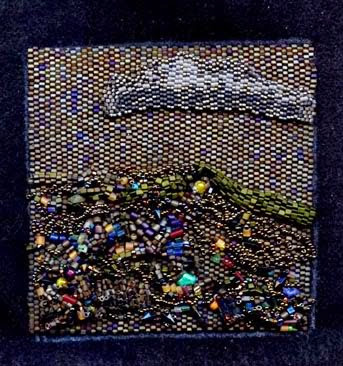 Dimensional beading worked over peyote stitch using a variety of beads such as hex, tiny 15/0 s, triangles, antique satin glass bugles, and other items. Never having visited the Gulf I had rather romantic visions of sleepy towns, long humid nights, evening walks along the levees and beautiful riverboats. I have put this fantasy of nights on the Mississippi in my block. But, alas, death and destruction were laying in wait – see the pretty water splashed by the paddle wheel peeking over the edge of the strong levee? the insignificant super dome? Freeform beading over brick stitch using many different types of beads. The tiny black kite shaped beads are antique Victorian mourning beads. 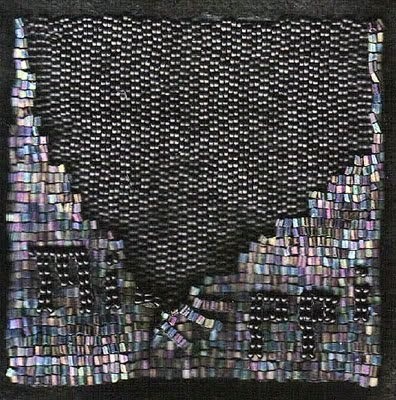 Ladies out of deep mourning, but still required to wear black, would sometimes add decoration to their dresses with black beads such as these. Mourning beads seemed appropriate to honor the memory of the many who died in the storm and in the aftermath when people died waiting for help that came days too late. Who knows how many of the still missing people lay buried in the ruins that are still scattered through the Gulf region. Like those killed by the storms and the aftermaths the mourning beads are scattered through the debris. The levee is broken. Family treasures, pearls, antique satin bugle bead, and other lovely beads are scattered throughout the ruins. Lives, homes, jobs, envisioned futures- all shattered by the storms and the pain of their loss worsened by the lack of timely, organized rescue efforts. If you lift up the cloud and look behind it you will find NO silver lining. Designing and making this seemingly simple block was very emotionally draining. I hope it will cause the viewer to stop and really think about all that happened in our country before, during, and after hurricanes Katrina and Rita. Have you heard anything from Mississippi? Title: Have you heard about Mississippi? Brick and peyote stitch worked in layers using 11/0 hex beads and Toho beads. Despite the horrendous damage done to the towns in Mississippi coastal area there has been very little coverage of this in the media. I have seen aerial photos taken by a local Maryland photographer that show miles, and miles, and miles of desvastion. Some towns are just gone...empty scoured land is all that remains. While talking to a lady whose family lives in the effected area she told me that it seemed as if Mississippi had become invisible. Only New Orleans is covered on the news here. Her voice shook with pain, despair and sorrow. This piece is worked on teal leather with bead embroidery, peyote stitch and freeform beading using mostly Delica 11/0 beads. Bald cypress, Taxodium distichum, is part of an extremely ancient species. Conifers have been here since before the dinosaurs walked this earth. For me they embody endurance and bring to mind the ordinary folk who have lived on the Gulf for generations. They will rebuild and farm their land and fish the Gulf, the river, lakes and bayous for generations to come because they BELONG there. They will endure despite the storms, the insurance scams, the government’s poor management and, for far too many, the hardships brought on by unemployment. These are the real people, not the politicians and businessmen, but the folks who have been there for hundreds of years or, in the case of our Native Americans, thousands of years. Like the bald cypress they have deep and enduring roots. My block is dedicated to Zulma who personifies the strength and endurance of this beautiful tree while she and her family struggle to start over after the storms. NOTE: Since the Tapestry was finished Zulma has lost her husband. He died in her arms from a heart attack as they waited for medical care that came too late. She continues to live in New Orleans caring for her elderly father in a damaged trailer.